Located in the heart of scenic Vermont, Killington is popular Vermont vacation destination. Killington is not only a world-famous ski resort, but a year-round destination for outdoor enthusiasts as well. With a myriad of challenging trails for both downhill and cross-country skiers, as well as wonderful outdoor summer festivals, this little area captures the essence of all things “Vermont”. Attractions and family activities include a visit to nearby Rutland Vermont for mall shopping, and live entertainment at the beautifully restored Paramount Theatre. A short drive east of Killington will bring you to Woodstock and the historic Billings Farm Museum, downtown art galleries, shopping, shops and restaurants. Regardless of what time of year you visit Vermont, you will be impressed by the beautiful scenery and relaxed lifestyle of this little New England state. From the vibrant colors of fall foliage to the tasty treats available during maple sugaring season, Vermont is a great family vacation destination. Visit Vermont’s numerous one-of-a-kind attractions, museums, galleries, antique shops, village stores, restaurants and inns. The Vermont lodging choices are big. Find the guaranteed lowest lodging rates in the state by visiting the links below. 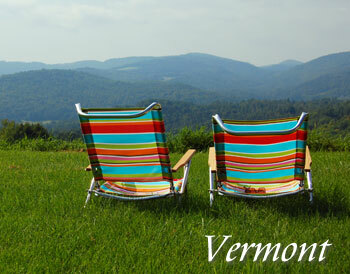 Choose from Vermont hotels, resorts, motels, motor inns, and destination lodges. Contact us to feature your Vermont hotel or lodging property. Perched on the shores of beautiful Lake Champlain and home to the University of Vermont, Burlington is truly Vermont’s cultural hub, and gateway to Quebec. Fairs and festivals, farm-to-table dining offering the freshest of Vermont-grown foods, live musical venue and great shopping at Church Street Marketplace – all and more are available for visitors and locals alike. With over 750 acres of skiable terrain and a vertical drop of more than 2000 feet, Stowe truly is a destination for ski bunnies of all abilities. Although the Apres Ski scene is a hot one, there is plenty to for the non-skiing folks to do as well. Arts and Crafts, shopping, spas and massage centers, a hot air balloon festival and several live performance venues for the theater-lovers are also available in stunning Stowe.